“Nowadays the electronic books and the devices related to them become more and more popular. However, many people still prefer reading the traditional paperback or hard bound books. If you are one of them and have a huge bookshelf at home, probably it is very difficult for you to find the books you need fast and easily. That is why you have to organise it and sort out all the items. 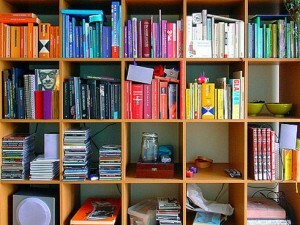 London cleaning experts advise you to start the process by taking all the books down the bookshelf. Make three piles of the books: books you want to keep, to recycle and to sell. The ones that you want to recycle, you can first offer them to a local library and if they do not need you can bring them to a local recycling box. The ones from the last pile you can sell online or at the local flea market. The number of the box from the first books will be probably biggest. You need to choose a way how to categorize them. There are many different methods you could apply – alphabetical order by author or title, division by genres or subjects, books you have already read and others still waiting to be read. You can even organise your book according to their colour or height. If your bookshelf is deep, put the most important and most frequently used books on the front row. The ones that you do not use too often can be placed behind. In order not to forget where you have put all the books, cleaning London companies recommend writing down the names of the categories you have already chosen and stick them to the first book of each class.